This foggy scene caught my eye this morning in the parking lot where I get my coffee. A short-school-bus driver was relaxing reading a book and having a smoke leaning against her bus. Then the local gorilla-giant tried one of the oldest tricks in the book in a shameless attempt to catch her unawares. I decided to let it play out to see how it ended but not before taking this snapshot with the cell. How did it end? Let’s just say there’s one sorry ape roaming the countryside. 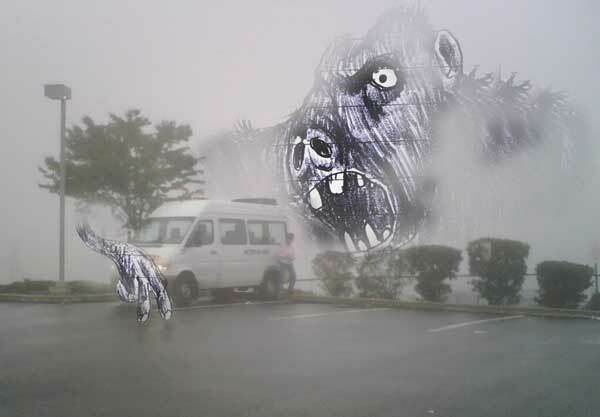 This entry was posted in ape, bus, creature, fog, gorilla. Bookmark the permalink.